What's Alison up to now? « Long time no update! The latest and greatest is that you can look for me soon on your TVs in a National Audi commercial! Yes, I'm very excited, too! I don't know when it will start airing, but we shot it already. It's called "Scripted Life", and you can recognize it by ALL the people holding big scripts in their hands while they go about their day. 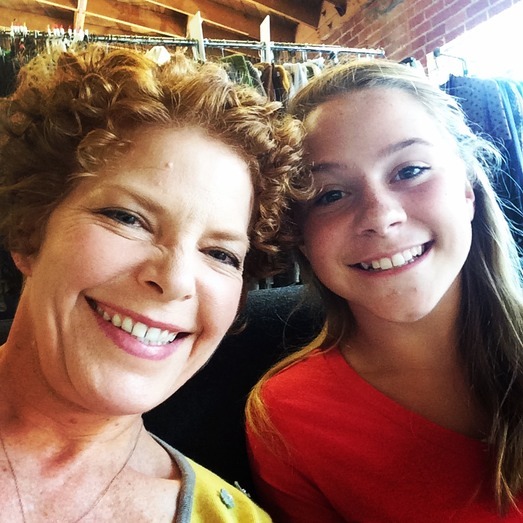 Here's me at the fitting with the adorable Fallon Heaslip, who played my daughter. We got paired together in the callback, so something must have been right! No, I didn't get to drive the car. I never even saw the car. It was a lovely experience, though. Everyone on the project was really nice, and the lead actor was also represented by the good folks in the commercial department at Clear Talent Group, my commercial agency. Thanks Allison, Michele, and Samantha. Go, Team CTG! Also a big thanks to Francene Selkirk Casting. They are great people who frequently call me in, for which I'm very grateful. I've booked TWO commercials with them (one was a Cingular spot, years ago). I've been quite busy this summer with that, some sculpting work, some Photoshop work, and some Photoshop and ZBrush classes. Nice to be able to bring in a little cash, as my dear husband has recently retired! I'm glad he can finally get some richly deserved R & R. He's never one to sit around, though, so all sorts of projects have been getting done around the house. I hope your summer is busy and productive, too!